Derek is a great friend of the salmon, whose corner he has fought for more years than I can remember. This work is the proceedings of the sixth International Atlantic Salmon Symposium and it is a seriously chunky read, dealing as it does with the future of an entire species. As with the proceedings of all symposia, it also comes at a seriously chunky price and it obviously takes no prisoners on the intellectual side. If you don't have some kind of qualification in biology, this book will be tough going. The introduction, by Professor Sir. 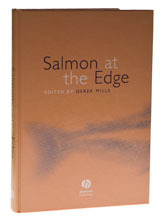 F. Holliday ends with the stark fact that the salmon is threatened by change in climate, in lifestyles, and in ecosystems; and Burke’s famous dictum that ‘No man made a greater mistake than he who did nothing because he could only do a little’. To read the papers which follow, particularly the section entitled ‘Running the Gauntlet’ is to appreciate just what the salmon is up against, in a world where the odds have been rigged against its survival. All is not doom and gloom, according to the presentations in ‘Beacons of Hope’, but writing this in a week when vast amounts of raw sewage have been discharged into the Thames on two occasions, I wonder just how committed we really are to a clean planet.